Each year, the College Board helps more than seven million students prepare for a successful transition from high school to college through programs and services in college readiness and college success, including the Advanced Placement (AP) Program. AP exam scores are reported on a scale of 1 – 5. Many colleges and universities grant credit and placement for scores of 3, 4, or 5 with a score of 3 being “qualified”, 4 being “well qualified”, and 5 being “extremely well qualified”. The AP program is an important part of the high school curriculum because it allows students to experience the rigors of college-level studies while they still have the support of a high school environment. Additionally, by participating in AP courses, students have the opportunity to be placed in advanced courses in college and earn college credit while still in high school, potentially saving families thousands of dollars on college tuition. 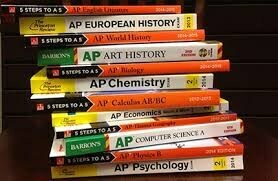 Additionally, students who take AP classes stand out in the college admissions process. St. Michael’s is pleased to report that its five-year average percentage of AP students with scores of 3+ is 73%. Comparatively, New Mexico’s five-year average is 46% and the national average is 61%. In order to qualify for Honors, Pre-AP, or AP courses at St. Michael's High School, a student must have a grade of A or B in the prerequisite Honors, Pre-AP, or AP course, or an A in the prerequisite regular course. A student who does not meet these requirements must have a teacher recommendation before going into an Honors, Pre-AP or AP class.